Last year when I decided to go off birth control and get my hormones in check, I learned ALOT about our bodies endocrine system and how everything we put in and ON our bodies affects us. Part of giving my hormones time to rebalance meant I had to get serious about the products I was using on a daily basis. From cleaning products to skincare, the more I read the more aware I became of just how harmful everything I had was. I couldn’t believe it! I had never thought twice about this. Here I was, eating organic broccoli and grass fed beef and slathering myself with nivea body lotion and aveeno moisturizer. I considered myself savvy in the wellness game but this was something I never looked into. After making sure the foods on my plate supported my birth control detox, I had to take this next step. I went through all of my skincare, my body wash, my lotions and threw out everything. Initially I replaced everything with coconut oil. (Ha!) Which is a great start for make up remover and body lotion. But then I needed cleanser, moisturizer, serums, you name it. Now, a year an a half later, I can’t say my whole beauty cabinet is 100% safer but it is getting there. I think of it as a marathon not a sprint. If you’re looking to move your products over to safer, less toxic options, I say start with the things you use the most and go from there. For me, that was cleanser, moisturizer and tinted SPF. Luckily for me, a friend introduced me to Beautycounter and explained the benefits of safer skincare. She literally dropped a whole line of it off to me so I feel like this switch to cleaner beauty kind of fell into my lap! Ha! After using the products for a week I was HOOKED! The regimen was outlined for me and the routine made my self care game 100%. From there, I ordered some of the products and added them to my routine. I’ve tried a bunch of safer alternatives since then, loved some, hated others. I’m all for safer, cleaner, non-toxic beauty care but it’s also gotta WORK. I’m trying to keep this skin and body looking young and chipper and I’ve definitely had my fair share of sun damage. So, if you’re new to clean beauty I thought I’d share what I use now that I absolutely love. 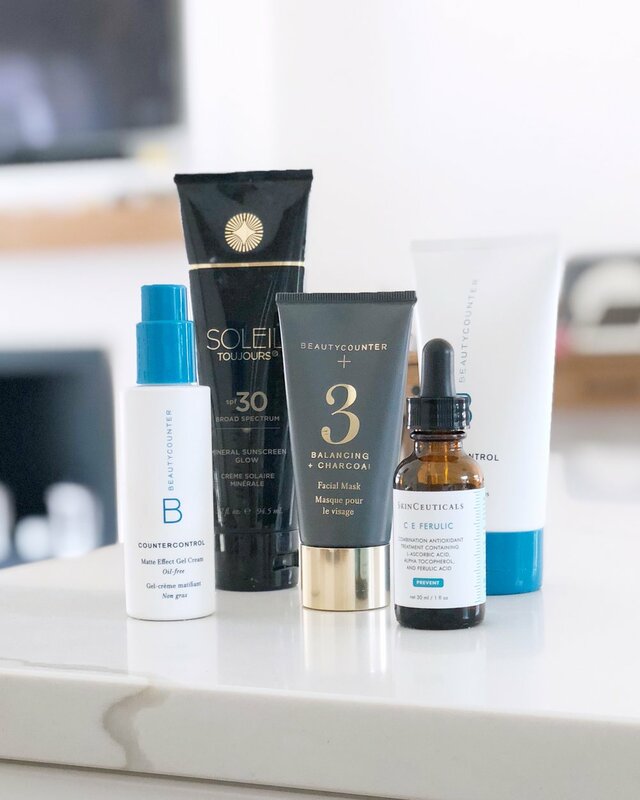 Now, not all of these products live up to the strictest of guidelines (aside from Beautycounter) but they are safer, more conscious alternatives. Vitamin C serum: now this isn’t what I consider “clean” but I’ve been using this for so long and it works so well that parting with it is hard. Lol! Beautycounter has one that is just as effective that I’ve tried but it is oil based. It was too heavy for me in the summer months so I’m eager to try it again once this bottle runs out. Also, they price point you can’t beat: skinceuticals is $168 and the Beautycounter one is $68. It lasts the same amount of time! Oil Free Moisturizer: while my vitamin C serum is absorbing I will usually brush my teeth. Afterwards I follow up with moisturizer all over my face and neck. This oil-free formula keeps me from looking shiny and greasy but makes my skin look super hydrated. Tinted SPF: once that’s on and absorbed I finish everything with the Soleil Toujours tinted SPF in Mineral Glow. I usually don’t wear any make up but this leaves my skin with just enough coverage (and slight glow) that I feel it’s all I need! Throughout the day, if I feel like my skin needs a quick refresh, I’ll spritz this rosewater facial spray all over! As for my PM routine, I try to keep it simple and add in a mask once or twice a week. Cleanser: I use the same cleanser at night! Acne Treatment: I use this Beautycounter all over acne treatment that I swear is the holy grail. I’ve use other salicylic acid treatments before but none has ever left my skin feeling hydrated and treated before. Some were drying and others just simply didn’t work. I put this all over my face every night and wake up with clear skin and a beauty glow. Moisturizer: I will *sometimes* follow up the acne treatment with the same moisturizer I use in the morning because it’s light and hydrating. In the winter months I’ll need something more but for now this works great! Most nights, however, I just leave the salicylic as my final step. It actually helps bring moisture to the surface of your skin all on its own! Sunday nights + 1x throughout the week I add in this charcoal mask. I’m prone to blackheads and congestion (which get worse if I eat a lot of starchy carbs, go figure) so doing a balancing charcoal mask helps remove excess gunk. And that’s my current routine! I’m not into a fifteen step routine (or spending all that money for that matter) but I do love a little regimen. It feels very “self-care” and I actually get excited to do each step every morning and night. Now, I will guess this routine will change as I get bored easily and my skin needs different things as the seasons change but when it does I will be sure to report back! Have you tried any safer beauty products yet?! Do you know what’s currently *in* the products you use now?! Feel overwhelmed with all this?? Start small. One purchase at a time!